It's shocking what happens in Flower Mound Studio after dark sometimes! 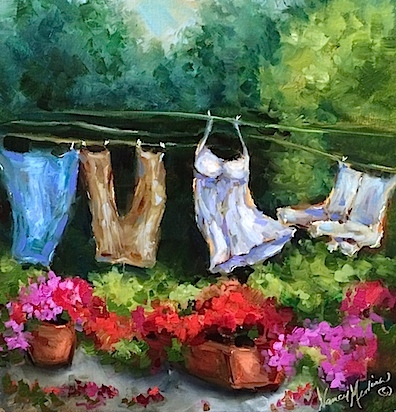 This scene from my visit to Southern France started out as a perfectly innocent and sedate laundry on the line kind of painting, and then a little breeze kicked up and the slip started some shameless flirting with the shirt and it was all downhill from there. The little dress is clearly trying to give the shirt the slip. At the very least, she's going to show him who wears the pants in the family, while the bystanders were just left hanging out to dry!